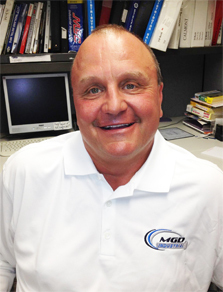 Meet David Dahlke, President of MGD Industrial Corp.
1. Tell me why you do what you do... What makes you passionate about your industry and your business? Dave: I love working with people, the challenge of providing solutions for my customers' needs, providing fast and efficient customer service.......I have over 25 years of experience in the field. Fasteners are used by everyone, every day and I am able to provide them! Building friendships with my customers both on and off the job. 2. Tell me what makes MGD Industrial different than any other distributor of fleet maintenance products. Dave: My staff is very knowledgeable and friendly. We try not to turn away any sale little or big. We can find hard to get items. We have little overhead so we can keep our prices at a very competitve rate for our customers. Over 20,000 items in stock and ready to ship everyday. We stock USA made Grade 5 & 8 HHCS. We have our own private labeled chemicals. Convenient custom designed assortments of all popular product lines. 3. Where do You see MGD Industrial Corp. in five years? Dave: In the last five years MGD's sales have increased 20%, I would like to see MGD grow another 20-25% in the next five years. I would like to be in a new warehouse. Growing the business through internet sales. Increase sales and staff. Dave: I have been married to my beautiful wife Joanne for 20 years and we have been blessed with 3 boys, Coltin, Christopher and Connor. I love to hunt, fish with my wife, go to concerts, spend as much time as I can with my boys, be it shooting hoops in the driveway, playing catch, throwing batting practice or just going to all of their sporting events.